Council to build new council homes! Oh wait, only 105. One of the demands of Hands Off Our Homes is for Leeds City Council (LCC) to build more council housing. With over 24,000 people on the waiting list for social housing and less than 7000 becoming available, the building of more social housing is desperately needed. This has been worsened by the continual demolition and selling off of council housing, since 1979 well over 30,000 social lets have disappeared. 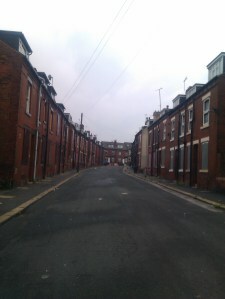 The problem is particularly acute for one-bedroom properties, there are going to be almost 5000 tenants seeking to downsize as a result of the bedroom tax yet there are only around 70 properties available on the Leeds Homes Register (list of available social housing, checked today) many of these with already 100 bids on. At first glance, we were delighted to see LCC announce the building of new council homes. Peter Gruen (who has responsibility for the council’s housing strategy) claims much of timely response from LCC is to deal with the increase in demand due to the bedroom tax (although seeing as the cuts take effect in less than 10 weeks, it is unclear what the council is going to do in the meantime). But 105!??!?! That’s 35 a year for the next three years!!! One has to question Gruen’s maths: 5000 people looking to downsize due to the bedroom tax, 150 new homes. Not particularly inspiring and certainly only a drop in the ocean when Leeds’ growing population is taken into account on top of the bedroom tax and the already huge waiting list. properties to rent just stuff about “affordable homes” with no explanation as to what that really means. In reality ‘affordable’ is generally not affordable to much of Leeds’ population and the partnership schemes mean that accountability and sustainability of the project are sacrificed to the market. With the private sector playing in increasingly large role in the housing market, including in terms of social housing, it is clear that this disappointingly small amount of council new builds only highlights the councils ambition to abandon the project of providing secure, decent housing for everyone. LCC is refusing to stand up for social tenants: they continually avoid investing in new housing and have so far failed to fight back against the bedroom tax (a tax on society’s most vulnerable for a fictional problem they didn’t create). LCC shouldn’t just roll over and accommodate the changes but argue to the Government and the Labour party that council and social tenants have a right to want more than one bed flat, they have a right to have family, friends and carers stay. To not be cramped. To live as well as someone in the private sector. We all have a right to a safe, secure, liveable space in which we can make our homes. The bedroom tax amounts to little more than demonising social tenants as a means of papering over the glaringly obvious, growing inequalities that make the social provision of housing all the more vital. hiya! any way to subscribe to your posts? Hey, added a link to the RSS feed on the right. Good to have you following us! cheers. looking forward to more. ← Bedroom Tax minister has 11 spare bedrooms!